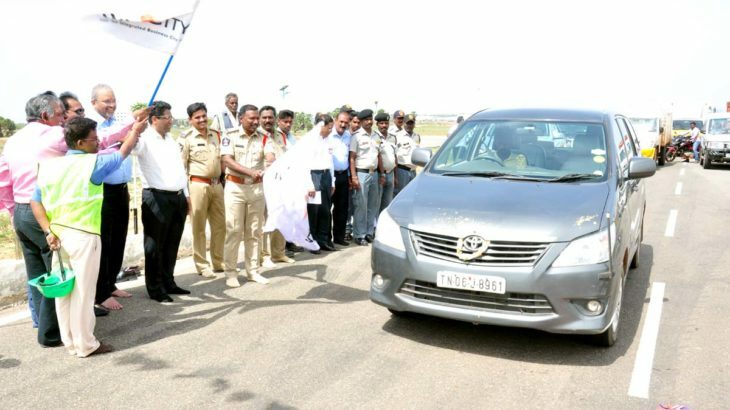 Sri City, July 06, 2017:- Mr. Narasimhulu, Circle Inspector of Police, Satyavedu, in the presence of Mr. Ravindra Sannareddy, Founder Managing Director, Sri City dedicated the Central Expressway in Sri City for public usage on Thursday. The 9-km Central Expressway, that connects NH-16 intersection and the Customs Point, has been designed as a four-lane road. Mr. Narsimhulu said that it is mandatory to use seat belts while driving a car, and wear helmets while riding a two wheeler. He appealed all the public to be attentive while driving. Speaking on the occasion, Mr. Ravindra Sannareddy said,”We hope, the road divider would facilitate free flow of traffic on either sides, enhancing road safety. I request all the commuters to strictly follow traffic rules to avoid accidents.” ”Let’s all join together to make Sri City a ‘zero accident’ city,” he called upon all the road users. Mr. Ravindra Sannareddy appreciated the services of the Engineering team of Sri City for completing the works in time, and acknowledged the services of Security staff and the local Police for regulating the traffic during road construction phase. He thanked all the customers of Sri City for extending all their cooperation and bearing all the hardships. Besides Mr. Satish Kamat, President (Operations), Mr. Shaikh Altaf, General Manager, Security & Vigilance and other senior officials of Sri City, the Sub Inspectors of Sri City and Varadayyapalem were present on the occasion.